Critics say the 2-ton amphibious passenger vehicles are inherently dangerous because their design creates numerous blind spots for drivers. Boston has a special fondness for duck boats, which have become a mainstay of parades celebrating sports championships. 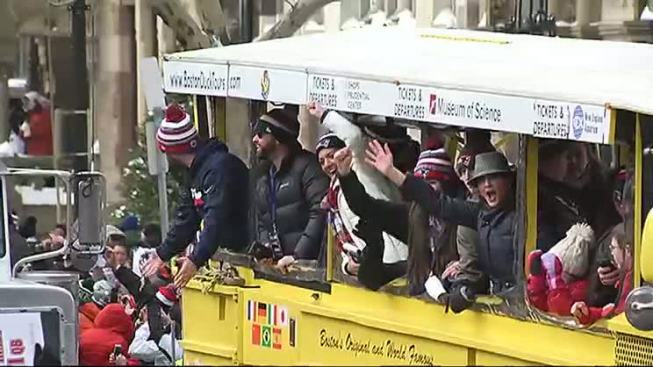 Earlier this month, two dozen duck boats carried the New England Patriots through the streets of Boston for a "rolling rally" to celebrate the team's Super Bowl win. "We believe that duck boats in their current design should be banned," said Ivan Warmuth, the father of Allison Warmuth, who was killed on April 30, 2016, when a duck boat ran her over on her motor scooter. Critics say the 2-ton amphibious passenger vehicles are inherently dangerous because their design creates numerous blind spots for drivers, who sit 10 to 12 feet behind the bow, making it difficult to see directly below and in front of them. Shoveling Fines: Does the City Have a Double Standard? Allison Warmuth's parents have pushed the industry to adopt new safety measures. They successfully lobbied for a Massachusetts law that requires duck boats to have blind spot cameras and proximity sensors. The new law also requires a second employee - separate from the driver - to narrate the tours. "I hear again and again from Boston Duck Tours and any of these other companies that safety is their No. 1 priority, and if that's the case, you can't argue that the safest way to operate the vehicles is for the driver to also be giving the tour," Moniri said. Boston Duck Tours chief executive officer Cindy Brown said the company "places a premium on the safety of its passengers" and touted additional cameras, a second person to narrate tours and new back-up sensors. Ride the Ducks of Seattle stopped using its older "stretch ducks" after the accident and is now only using newer "truck ducks," said spokesman Mark Firmani. The company also added 365-degree video coverage and a second employee to narrate tours, he said. Stacey Soto's mother, 63-year-old Rosemary Hamelburg, died in 2003 after falling backward off a duck boat onto a Boston parking lot. Soto said that despite being longtime Patriots season ticket holders, her family has been unable to enjoy the team's victory rallies. "None of us can watch any of the duck boat parades," she said. "It's too painful."